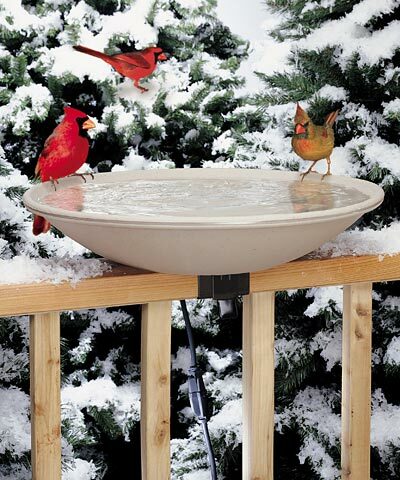 Place the Allied Precision Deck Mounted Heated Bird Bath on your favorite deck rail so you can enjoy birds up close. This generous, heated bath will surely entice birds to visit your area, creating an avian focal point on your deck. The 18.5" diameter basin has a gentle slope inward, reaching a 2" depth for songbirds to bathe easily. Its contoured rim makes perching simple, and the textured surface helps birds retain a grip in the bath. Fully tested in sub-zero conditions, this basin will not crack in the winter cold, and the heating element is completely hidden beneath the bowl. This versatile heater uses 150 Watts of thermostatically controlled power, turning on only when the temperature nears freezing to keep the water in the bath free of ice. The speckled finish within the tan unit evokes stone, and the plastic construction ensures durability. The included, EZ-Tilt deck mount allows this bath to connect to a wooden 2" x 4" or 2" x 6" deck rail easily, perfect for use in apartments or condos. This bracket also enables you to tilt the bowl upward for cleaning and refilling the basin. Create a bird friendly area on your deck all year with this Deck Mounted Heated Bird Bath. Made in the USA. Three year warranty.